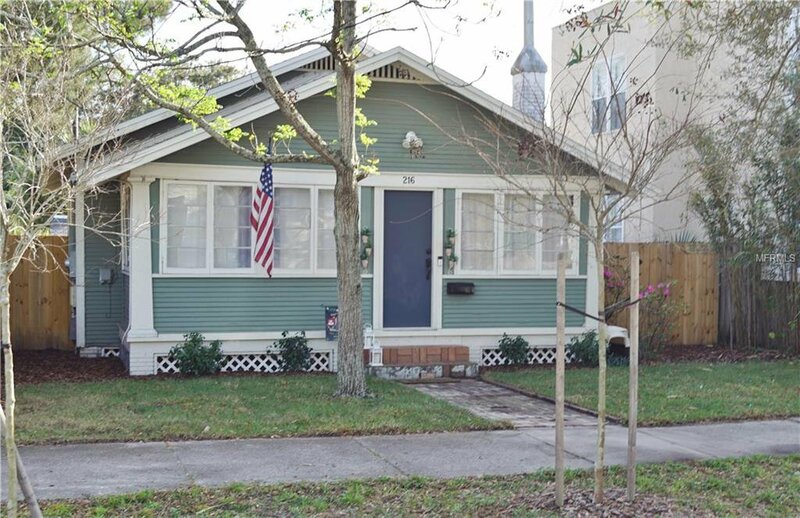 Welcome to 216 W. Woodlawn, a CHARMING 2 bedroom bungalow in Historic Tampa Heights. This home has the original, BEAUTIFUL hardwood floors and all of the classic large trim work. The bathroom of this home has recently been remodeled and is STUNNING. This home has a decorative fireplace that adds to the appeal of the living/ dining room. The roof is 3 years young and there is an inside laundry room at the back of the home. This large yard is fully fenced in and offers plenty of room in the backyard for outdoor activities, along with a newer shed. This home has an enclosed front sun room that can be used as an office, playroom, exercise room, etc. You will have a short trip to all that Tampa has to offer: The Riverwalk, Seminole Heights Restaurants, Armature Works, Ybor District, and the Channel Area. Plymouth Playground is a few blocks away. Schedule your showing today! Listing courtesy of KELLER WILLIAMS REALTY. Selling Office: LOMBARDO TEAM REAL ESTATE LLC.